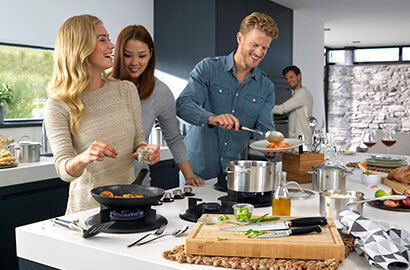 USE AND CARE YOUR COOKWARE – IT’S A PLEASURE We are happy that you are interested in cooking and that you want to know the right use and care for your cookware. 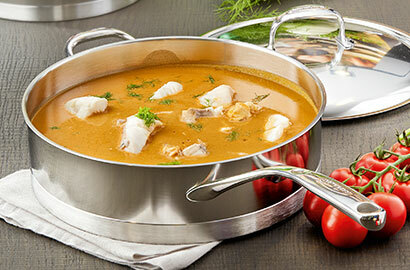 We believe that the best cookware makes preparing food a pleasure. Which adds to the overall enjoyment of cooking. And, we hope you enjoy reading. You don’t want to cook the second best dinner – you want a perfect cooking result. So go for high-quality ingredients, cookware and cooking utensils—and choose people you like to cook with or for, of course. Our extensive product range offers the right pot for every purpose – and this website helps you find it. An absolute must-have. This all-purpose pot for cooking pasta, potatoes, rice, vegetables and meat. The perfect pot for roasting, braising and stewing. Ideal for larger pieces of meat, stews and chili, as well as cooking vegetables. 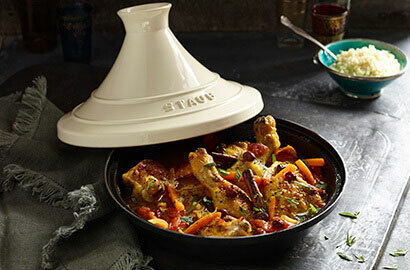 STAUB Cocottes are the perfect stove to oven to table cookware. You can roast lamb, chicken and beef. At the same time Cocottes are all-rounder: from a good risotto to baking bread. Essential, timeless pieces that no kitchen will want to be without. 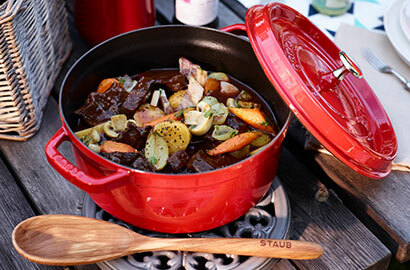 STAUB cookware ensures gentle and natural cooking to retain the full flavor, the aromas and vitamins in your food. The special lids lock in moisture, ensuring that the food is basted evenly and continuously to create the most delicious dishes. Thanks to its material – cast iron – a Cocotte retains heat or cold for a very long time. Learn more about how to cook in your Cocotte on YouTube. 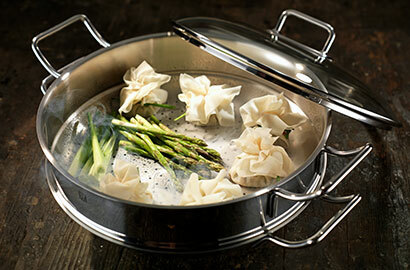 From searing to simmering, Braisers & Sauté Pans are the go-to-pans for gourmet cooks. The versatile and compact roasting pan ensures outstanding cooking results. Use it for preparing meat and vegetables and for stirring, braising and sautéing on the stovetop. Also suitable for preparing and heating up sauces and small dishes. The base of the insert is perforated, it fits on any pot with the same-sized diameter and should be used with a lid. 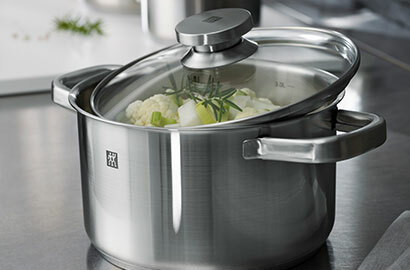 The steam that is produced on the inside of the pot flows through the perforations and cooks the food extremely gently. The insert allows you to simultaneously cook on two levels. 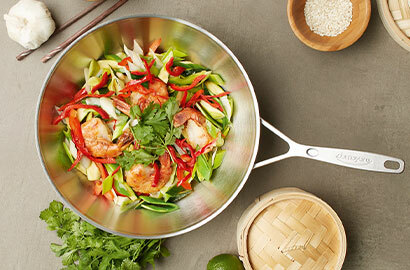 A wok lets you cook delicious dishes in a variety of different ways: stir-frying, deep-frying or steaming. Thanks to its funnel shape, the middle of the pan heats up very quickly to the ideal temperature for frying. The perimeter zones, by contrast, only heat up slowly – food can continue to cook gently here, without being overly cooked in the liquid. Vegetables, fish and meat remain wonderfully al dente and retain their full flavor. 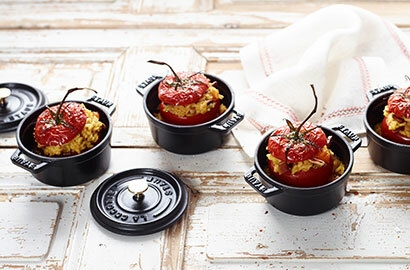 STAUB Mini Cocottes are perfect for preparing and serving individually sized dishes. They are often used for catering and are sure to enhance your table at home while impressing your guests. Contemporary design meets French culinary tradition in this high-quality oven to table piece. 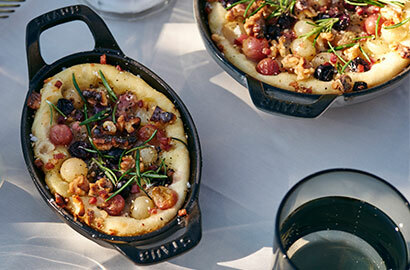 The adaptable and functional serving dishes by STAUB present your meat, fish and side dishes in the best possible way. And don’t forget the gravy boat for the perfect pairing. 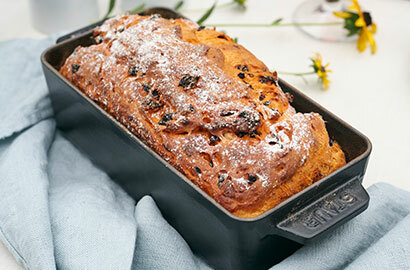 Elegantly and effortlessly from oven to table, STAUB Baking Dishes & Roasters are indispensable to any gourmet kitchen. 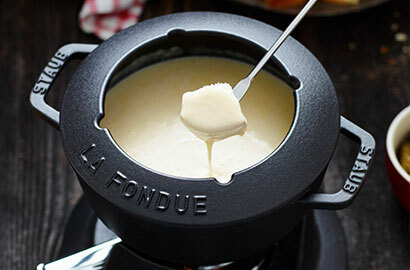 Gather around STAUB Fondue Pots for a fun and flavorful dining experience. The fondue sets come in many different shapes and sizes. They are also great for cheese or chocolate fondue. 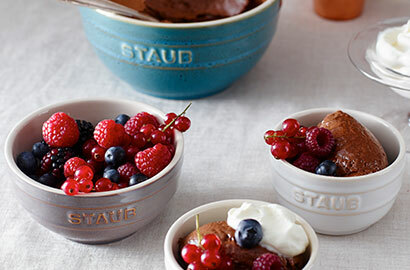 Our Ramekins & Bowls are sturdy enough for prepping and pretty enough to serve tableside. Showcase your culinary creations for friends or family in the most wonderful way. 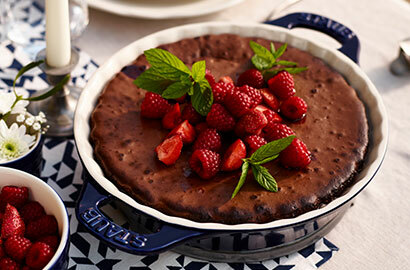 STAUB Pie Dishes conveniently allow cooks to present pies beautifully in the same dish in which they were baked. 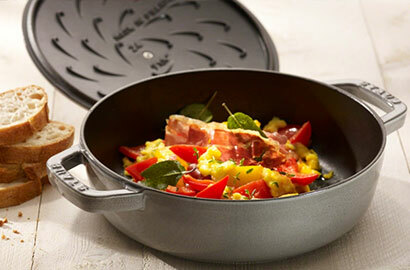 Dress up your dinner table with Specialty Cookware and get cooking results as locals would do. These items bring global culinary traditions into your home and include tajines, special shapes or mussel pots with the advantages of cast iron. 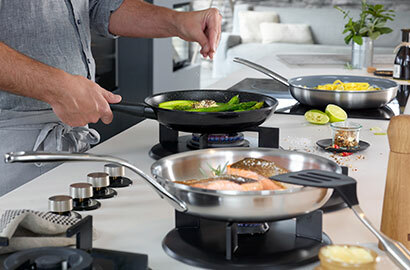 Choosing the right pan can be a tricky experience: the wealth of different coatings, materials and special features makes purchasing the right pan somewhat challenging. 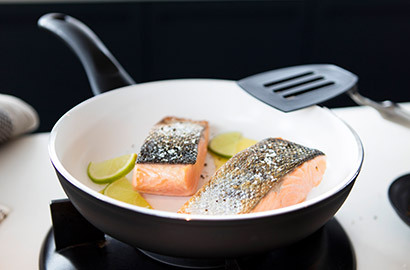 We want to help you with this guide to the most common cookware materials and coatings – and the pros and cons of each. 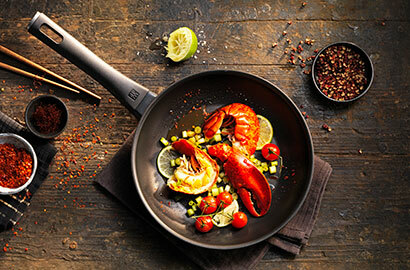 The right frying pan for searing food with rich caramelized flavors. This pan has a black matte enamel coating on the inside that guaranties a nice crust and intensifies the natural flavors of foods. You can use it with electric, gas, ceramic, halogen, or even induction and the oven in case of cast iron handles. Cast iron is ideal for the perfect steak. 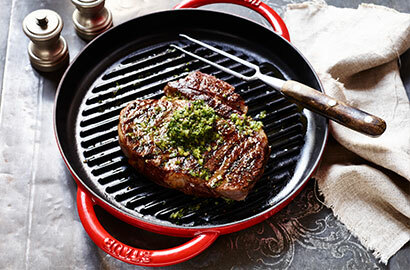 A special version is the grill pan with streamlined shape and deep grill ridges for searing grill marks into food. Learn more about how to use your cast iron grill pan on YouTube. This pan is the right choice for searing. 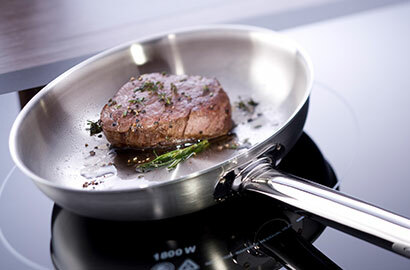 A stainless-steel frying pan is the right choice for meat like filets or steaks but also for fried potatoes. Its surface is extremely hygienic and flavor-neutral , making it ideal for tomato sauce since this non-reactive surface it won’t impart a metallic taste. The perfect pan for frying food that is likely to stick. For gently frying delicate foods such as eggs, vegetables and fish. You can use almost all nonstick pans with electric, gas, ceramic, halogen and induction. Ceramic coating is ideal for gentle frying. If low-fat cooking is a priority, ceramic coating is a good choice. You can use almost all ceramic coating pans with electric, gas, ceramic, halogen and induction. As much as people love cooking and enjoy eating – nobody is really into cleaning. But our cookware is extremely high grade, not just in terms of its appearance, but also in terms of delivering excellent results. So it is absolutely worth it to maintain the optimum durability of the materials. And that brings us back to the main topic: how to clean your cookware. Your cast iron cookware can be easily cleaned with any common washing-up liquid and water once it’s cooled down. Do not use any scouring agents or abrasive sponges to clean your cast iron product. To remove stubborn dirt we recommend that you soak your cookware, e.g. your cocotte, in warm water with a little washing-up liquid or baking soda until all of the residue can be removed. The cast iron pot or pan should be dried completely. Learn more about how to clean a cast iron Cocotte and how to to get rid of resistant residue on YouTube. Before washing pots and pans made out of stainless steel, they need to cool down. Glass lids, in particular, can be damaged by temperature shocks. 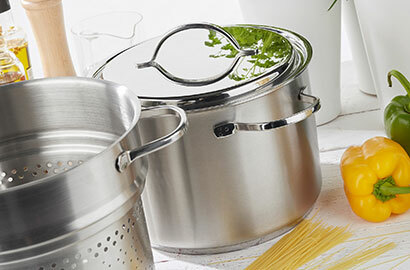 Our cookware is easy and convenient to clean and dishwasher-safe. But we recommend cleaning it by hand with warm water, a little washing-up liquid and a soft cloth. Serious dirt on the inside and base of the cookware can be removed using the rough side of a sponge. Do not allow remnants of food to dry to avoid stains or discoloration on the stainless steel. Use proprietary stainless steel cleaners, lemon juice or vinegar to remove white or rainbow-colored discoloration and deposits. Do not use your cookware to hold acidic food for any length of time and avoid aggressive cleaning agents as they can damage the surface. Cookware with nonstick coating needs to cool down as well. We recommend washing by hand with a soft sponge and liquid detergent. When cleaning in the dishwasher, you should use liquid dishwasher detergent and a low-temperature program. This helps to protect your pots and pans as well as the environment. Cleaning in the dishwasher does not affect the quality of the cookware, it may, however, cause discoloration. Please do not use abrasive cleaning agents, steel wool, dishwasher powder or oven cleaner. Cookware made of untreated aluminum or uncoated aluminum is not suitable for cleaning in the dishwasher. This may speed up the oxidation process, which leaves visible traces. We know it is sometimes more convenient to use the dishwasher, but in this case it just isn’t possible. You have to clean aluminum cookware by hand.